This entry was posted on January 22, 2015 by Jessica Anderson. Cheering the Hawks on to victory! The countdown is on! The game of the year, Superbowl XLIX, is a little over a week away! Our beloved Seattle Seahawks will face the New England Patriots on Sunday, February 1st in Phoenix, AZ. Back to back Super Bowls = History in the making! It's been another amazing NFL football season and our city and fans have responded. After an extremely stressful and epic playoff game against Green Bay this past Sunday to clench the NFC title, everyone in the Pacific Northwest is recovering from the adrenaline. We are ready and hyped for the Super Bowl! Facebook is blowing up, travel plans are being made, 12 man jerseys are everywhere, and this Friday Issaquah, our lovely suburb of Seattle, is hosting a Seahawks rally! Not only are the Seahawks players local heroes, but the Pacific Northwest is seriously sick with 12th Man Fever!!!! 12th Man signs, flags, and jerseys are everywhere you look. It's super exciting! 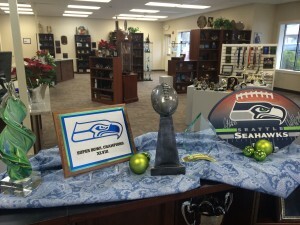 Awesome awards for your Super Bowl party! Do you have Super Bowl Fever too? Host a Super Bowl Party! Consider one of our Lombardi Replica Trophies as part of your décor. Have a pool and the winner can take home the hardware! 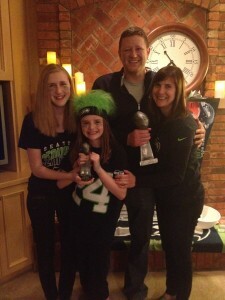 We are thrilled to be living in the PNW, cheering our team on to victory! Enjoy the game and GO SEAHAWKS!